The Plantation Volunteer Fire Association was established in 1956. 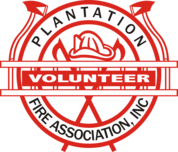 The Plantation Fire Department was started in 1957 by 22 original Plantation residents including Mayor and former Fire Chief, Frank Veltri and City founder, Fred Peters. The Association provides the personnel to the City to staff the Plantation Fire Department. Today the Association is comprised of more than 250 members all with the single interest of serving the citizens of Plantation. Over the years the Association has grown to include so much more than just a group of firefighters. The Association conducts two annual, City-wide events that also serve as fundraisers. The Annual Barbecue will celebrate its 60th Anniversary in November and has its roots all the way back to the beginning of the Fire Department. It has grown to be one of the largest and oldest traditions in the City. Click on the barbecue link above and order your tickets now. Also be sure to sign up for our A-List to receive updates on Association events and programs. The Annual Golf Tournament is a favorite of many City residents and business partners alike. Held in May at the Jacaranda Country Club, the annual event hosts more than 150 golfers and is sold out every year. Looking to hit the links for a great cause? Click on the events link to learn more.